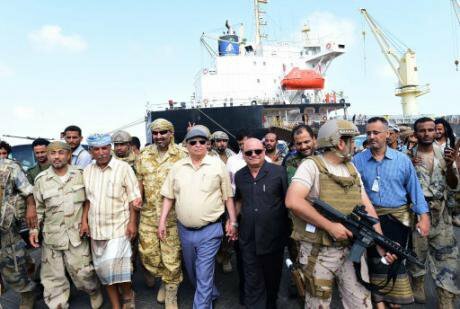 Yemeni President Abed Rabbo Mansour Hadi, center, walks with officials as he tours in the port of Aden, Yemen, Monday, Jan. 4, 2016.Wael Qubady /Press Association. All rights reserved. Thirteen months into the full scale war which has encompassed the country, negotiations started in Kuwait on 21 April between the Saleh-Huthi alliance who control the Yemeni northern highlands and the capital Sana’a and the internationally recognised government of president Hadi who was elected in 2012, and has been in exile in Riyadh for most of the last year. First Saudi Arabia: to many people’s surprise, the regime installed in January 2015 under king Salman, is behaving differently from its predecessors, in Yemen and beyond. Although only Deputy Crown prince, young Mohammed bin Salman, the king’s favourite son, has taken a leading role and clearly wants to demonstrate his capacity as an effective ruler, anticipating his own rise to the highest position. Saudi Arabia has been less than happy about western media coverage of the destruction and killings caused by its coalition air strikes, let alone votes in the European and Dutch parliaments opposing continued arms sales. 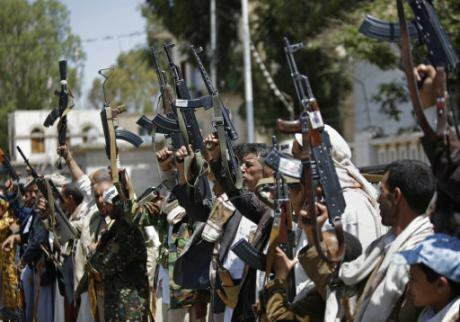 Shiite Houthi tribesmen show support for the Houthi movement in Sanaa, Yemen, May 19, 2016, after Yemeni Foreign Minister announces another suspension of Kuwait peace talks. Hani Mohammed /Press Association. All rights reserved.There is no doubt that the military stalemate is a major reason leading to the Kuwait negotiations. After 14 months of full-scale war on the ground and massive aerial bombings, the military situation is largely unchanged. Without going into details, overall, the northern Zaydi highlands are under the control of the Saleh Huthi alliance, bordered by a number of hot fronts, Nehm about 60km east of Sana’a, Jawf and Mareb beyond it, on the Red Sea coast along the Saudi border, south in Taiz governorate, extending to the Bab al Mandab strait, south east around al Baidha, with intermittent fighting in various other locations. Aden is, since that time, a city whose daily routine includes assassinations, kidnappings, suicide attacks, demonstrations of government employees demanding payment, demonstrations by southern separatists with occasional electricity and water supplies. The cease fire which started on 10 April initially considerably reduced air strikes, with some days when none occurred, but these, as well as fighting on the ground have returned to their earlier level as the Kuwait talks stalled. When talks show some signs of progress, however small, air strikes and fighting reduce: they increase as the talks are interrupted. Reduced fighting has allowed for some improvements in the delivery of basic foodstuffs and aid, despite the fact that the amounts landing in the ports have been way below requirements. The UN’s humanitarian appeal is “only asking for the minimum that is required to keep people alive in these awful circumstances," and only targets 65% of those in need, but has only received 16% of the funds required.